The 5 Most Common Dermaplaning Myths - Busted! As we head into the warmer months, the time for aggressive facial treatments is long gone, but that doesn't mean you still don’t want or need one! To help maintain that healthy glow you got after repairing all the damage you did last summer - one of our favorite non-invasive treatments is dermaplaning. 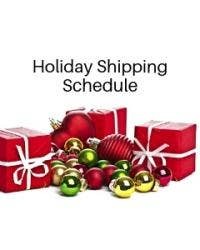 Make sure your holiday packages arrive on time!